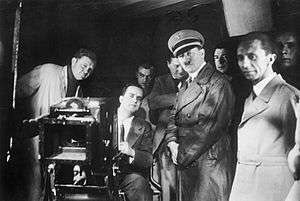 Hitler, Goebbels, and others watch filming at Ufa, 1935. Nazism created an elaborate system of propaganda, which made use of the new technologies of the 20th century, including cinema. Nazism courted the masses by the means of slogans that were aimed directly at the instincts and emotions of the people. The Nazis valued film as a propaganda instrument of enormous power. The interest that Adolf Hitler and his propaganda minister Joseph Goebbels took in film was not only the result of a personal fascination. The use of film for propaganda had been planned by the National Socialist German Workers Party as early as 1930, when the party first established a film department. The picture, in all its forms, including the film, has better prospects. … In a much shorter time, at one stroke I might say, people will understand a pictorial presentation of something which it would take them a long and laborious effort of reading to understand. Further short Nazi films about party rallies were made in 1927 and 1929. The first NSDAP film office was established in 1931 and started producing "documentaries" in a larger scale, e.g. in 1932 „Hitlers Kampf um Deutschland“ (Hitler's fight for Germany), „Blutendes Deutschland“ (Germany is bleeding), „Das junge Deutschland marschiert“ (The German Youth is on the March). Without any doubt the film is a formidable means of propaganda. Achieving propagandistic influence has always demanded a ‘language’ which forms a memorable and passionate plot with a simple narrative. … In the vast area of such ’language’ that the recipients are directly confronted by in the course of technical and economical processes, the most effective is the moving picture. It demands permanent alertness; it’s full of surprises concerning the change of time, space, and action; it has an unimaginable richness of rhythm for intensifying or dispelling emotions. Goebbels, who appointed himself "Patron of the German film", assumed, accurately, that a national cinema which was entertaining and put glamour on the government would be a more effective propaganda instrument than a national cinema in which the NSDAP and their policy would have been ubiquitous. Goebbels emphasized the will to end the "shamelessness and tastelessness" that he thought could be found in the former movie industry. The main goal of the Nazi film policy was to promote escapism, which was designed to distract the population and to keep everybody in good spirits; Goebbels indeed blamed defeat in World War I on the failure to sustain the morale of the people. The open propaganda was reserved for films like Der Sieg des Glaubens and Triumph des Willens, records of the Nuremberg rallies, and newsreels. There are some examples of German feature films from the Third Reich that deal with the NSDAP or with party organizations such as the Sturmabteilung, Hitler Youth or the National Labour Service, one notable example being Hitlerjunge Quex about the Hitler Youth. Another example is the anti-semitic feature film Jew Suss. The propaganda films that refer directly to Nazi politics amounted to less than a sixth of the whole national film production, which mainly consisted of light entertainment films, although it is those propaganda films that are much more well known today, such as Triumph of the Will. For conceiving a Nazi film theory Goebbels suggested as formative material the Hamburg Dramaturgy and Laokoon, or the Limitations of Poetry by Gotthold Ephraim Lessing, and also demanded "realistic characters" pointing to Shakespeare. Goebbels emphasized Lessing's idea that "not only imagining per se but purposeful imagining would prove the creative mind". Emil Jannings wrote in 1942 in the National Socialist Monthly about the goal of showing men and women who can master their own fate as models for identification. The authorities and NSDAP departments in charge of film policy were the film department of the Ministry of Propaganda, the Chamber of Culture (Reichskulturkammer), the Chamber of Film (Reichsfilmkammer), and the film department of the Party Propaganda Department (Reichspropagandaleitung). A system of "award" was used to encourage self-censorship; awarded for such things as "cultural value" or "value to the people", they remitted part of the heavy taxes on films. Up to a third of the films in the Third Reich received such awards. 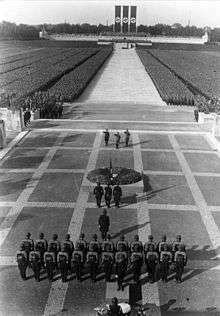 The Totenehrung (honouring of dead) at the 1934 Nuremberg Rally. SS leader Heinrich Himmler, Adolf Hitler and SA leader Viktor Lutze (from L to R) on the stone terrace; from Triumph of the Will directed by Leni Riefenstahl. To subdue film to the goals of propaganda (Gleichschaltung), the Nazi Party subordinated the entire film industry and administration under Joseph Goebbels' Ministry of Propaganda, and gradually nationalized film production and distribution. A state-run professional school for politically reliable film-makers (Deutsche Filmakademie Babelsberg) was founded, and membership of an official professional organization (Reichsfilmkammer) was made mandatory for all actors, film-makers, distributors etc. The censorship that had already been established during World War I and the Weimar Republic was increased, with a National Film Dramaturgist (Reichsfilmdramaturg) pre-censoring all manuscripts and screenplays at the very first stages of production. Film criticism was prohibited and a national film award established. A film bank (Filmkreditbank GmbH) was established to provide low-interest loans for the production of politically welcome films, and such films also received tax benefits. In the mid-1930s, the German film industry suffered the most severe crisis it had ever faced. There were multiple reasons for this crisis. Firstly, many of the most capable actors and film-makers had left the country after the rise to power of the Nazi government; others had been banned by the new Reichsfilmkammer. These people left a gap that the film industry could not easily fill. Secondly, the remaining actors and film-makers seized the opportunity to demand higher salaries, which considerably increased production budgets. Consequently, it became more and more difficult to recover production costs. Thirdly, the export of German films dramatically dropped due to international boycotts. In 1933, exports had covered 44% of film production costs; by 1937, this figure had dropped to a mere 7%. More and more production companies went bankrupt. The number of companies dropped from 114 (1933–35) to 79 (1936–38) to 38 (1939–41). This did not necessarily lead to a decrease in the number of new films, as surviving production companies became more prolific, producing many more films. Nazi companies went on to produce co-productions with companies of other countries: 8 co-productions with the Kingdom of Italy, 6 co-productions with the French Third Republic, 5 co-productions with the Kingdom of Hungary, 5 co-productions with Czechoslovakia, 3 co-productions with Switzerland, 2 co-productions with the Second Polish Republic and the Empire of Japan (e.g. The Daughter of the Samurai), and one each with Francoist Spain, the United States,the Kingdom of Yugoslavia, and Sweden. The consolidation of the film industry was undoubtedly beneficial for the Nazi government. On the one hand, an ailing and unprofitable film industry would not have been of much use for the propaganda requirements. And on the other hand, a small number of big film production companies were easier to control than a multitude of small ones. Goebbels went even further and directed a holding company – Cautio Treuhand GmbH – to buy up the stock majorities of the remaining film production companies. In 1937, the Cautio acquired the largest German production company, Ufa, and in 1942 merged this company with the remaining companies – Terra Film, Tobis, Bavaria Film, Wien-Film and Berlin-Film – into the so-called “Ufi-Group”. With one stroke, the entire German film industry had been practically nationalized, but unlike the situation in the USSR, German film-making preserved its character as a private industry. Although Goebbels founded the Filmkreditbank GmbH in order to fund the industry, the funds came from private investors. Thus, there were no government subsidies to the film industry in Nazi Germany. Because of this, the industry was forced to remain profitable – and to produce films that met the expectations of the audience. A concentration also took place in the distribution field. In 1942, the Ufa-owned Deutsche Filmvertriebs GmbH (DFV) took the place of all companies so far remaining. For the export of films to foreign countries special companies had been established such as the Cinéma Film AG. Since the days of the Weimar Republic, there had also existed an extensive system of educational film hire services which was extended under the Nazi administration. In 1943, there were 37 regional services and 12,042 city services. In parallel, the Party Propaganda Department (Reichspropagandaleitung) ran its own network of educational film hire services which included 32 Gaue, 171 district, and 22,357 local services. All film hire services had extensive film collections as well as rental 16 mm film projectors available that made it possible to show films in any class or lecture room and at any group meeting of the Hitler Youth. Apart from the Ufa-owned cinema chain, the cinemas were not nationalized. The majority of the 5,506 cinemas that existed in 1939 within the so-called Altreich (the "Old Reich", i.e., Germany without Austria and the Sudetenland) were small companies run by private owners. However, a large number of rules and regulations issued by the Reichsfilmkammer limited the entrepreneurial freedom of the cinemas considerably. For instance, it was mandatory to include a documentary and a newsreel in every film programme. By a law of 1933 (the Gesetz über die Vorführung ausländischer Bildstreifen vom 23. Juni 1933) the government was also entitled to prohibit the presentation of foreign films. An import quota for foreign films had been set during the Weimar Republic, and during World War II, the import of films from certain foreign countries was completely prohibited. For example, from 1941 onwards, the presentation of American films became illegal. A quantitative comparison of the percentage of German movies screened vs. foreign movies screened shows the following numbers: in the last year of the Weimar Republic the percentage of German movies was 62,2%, and in 1939 in the Third Reich it was 77,1% while the number of cinema visits increased by the factor 2.5 from 1933 to 1939; on the contrary the percentage of for example American movies screened was reduced from 25,8% in 1932 to 13,9% in 1939; eleven US movies were considered "artistically valuable" by the Nazi authorities. In order to boost the propaganda effect, the Nazis supported film shows in large cinemas with large audiences where the feeling of being part of the crowd was so overwhelming for the individual spectator that critical film perception had little chance. Film shows also took place in military barracks and factories. The Hitler Youth arranged special film programmes (Jugendfilmstunden) where newsreels and propaganda films were shown. In order to supply even rural and remote areas with film shows, the Party Propaganda Department (Reichspropagandaleitung) operated 300 film trucks and two film trains that carried all the necessary equipment for showing films in, for example, village inns. The dislike that Goebbels and other film politicians had for individual, more private film viewing was probably one of the reasons why they did not make any effort to develop television – at that time a technique that was ready to be applied – as a new mass media. Film propaganda had the highest priority in Germany even under the severe conditions of the last years of World War II. While schools and playhouses stopped working in 1944, cinemas continued to operate until the very end of the war. In Berlin for instance, anti-aircraft units were posted specially to protect the local cinemas in 1944. 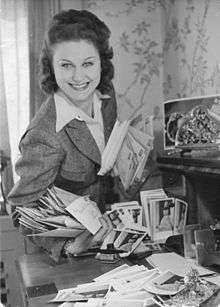 Marika Rökk with fan mail, c. 1940. There always had been film stars in Germany, but a star system comparable to the star system in Hollywood did not yet exist. Various Nazi leaders denounced the star system as a Jewish invention. However, in order to improve the image of Nazi Germany, Goebbels made great efforts to form a star system. After Marlene Dietrich and Greta Garbo had gone to Hollywood and could not be persuaded to serve the National Socialist film industry as figureheads, new film stars were promoted. The best-known example is the Swedish actress Zarah Leander who was hired in 1937 by the Ufa and became the most prominent and highest-paid German film star in only a few years. The publicity campaign for Leander was run by the press office of the Ufa, which concealed her past as a film actress already well known in Sweden and put their money right away on her charisma as a singer with an exceptionally deep voice. The Ufa press office provided the newspapers with detailed instructions on how the new star would have to be presented, and even the actress herself had to follow detailed instructions whenever she appeared in public. This kind of star publicity had not existed in Germany before. Prominent politicians such as Hitler, Goebbels, and Hermann Göring appeared in public flanked by popular German film actors. The female stars in particular were expected to lend some glamour to the dry and male-dominated NSDAP events. Hitler's preferred dinner partners were the actresses Olga Tschechowa and Lil Dagover, and from 1935, Hermann Göring was married to the popular actress Emmy Sonnemann. The relationships of Goebbels to several female film stars are also notorious. Magda Goebbels left a screening of the film Die Reise nach Tilsit, because it seemed to her too close a telling of her husband's relationship with Lida Baarova, which had resulted in the actress being sent back to her native Czechoslovakia. Personal proximity to the political leaders became a determining factor for the career success of film actors. An informal system of listings decided how frequently an actor would be cast. The five categories extended from "to cast at all costs even without a vacancy" (for instance Zarah Leander, Lil Dagover, Heinz Rühmann) to "casting under no circumstances welcome". How crucial the film stars were for the image of the National Socialist government is also evident from the tax benefits that Hitler decreed in 1938 for prominent film actors and directors. From that time on, they could deduct 40% of their income as professional expenses. The Nazi film theorist Fritz Hippler wrote in his 1942 book Contemplations on Filmmaking: "enough has been written as to whether "celebritism" is beneficial or harmful—but one way or the other, it cannot be denied that throughout the world a main motive of people going to the movies is to see the faces they know and love" and Hippler suggested that the stars to be chosen for Nazi cinema should have "European standard" and at the same time appeal to the "Germans' ideal of beauty", so that Germans could identify with them. Non-German actors in the Nazi cinema were e.g. Zarah Leander, Marika Rökk, Lída Baarová, Pola Negri, Adina Mandlová, Johannes Heesters, Iván Petrovich, Laura Solari, Angelo Ferrari, Rossano Brazzi, Nikolay Fyodorovich Kolin, Boris Alekin (Russian), Igo Sym (Polsih). In 1944 Joseph Goebbels issued a now infamous list with "irreplaceable artists" called the Gottbegnadeten list, which included people such as Arno Breker, Richard Strauss and Johannes Heesters. During World War II German film stars supported the war effort by performing for the troops or by collecting money for the German Winter Relief Organization (Winterhilfswerk). Although most of the male stars were exempted from military service, some – such as the popular Heinz Rühmann – participated in the war as soldiers, often accompanied by newsreel film crews. ↑ Adolf Hitler, Mein Kampf, Page 526. The translation give is by James Vincent Murphy. ↑ Geschichte des deutschen Films, edited by Wolfgang Jacobsen, Anton Kaes, Berlin, Stuttgart, Weimar, 1993, page 73. ↑ Hans Traub, Der Film als politisches Machtmittel, Munich, 1932, page 29. Original German text: "Ohne Zweifel ist der Film als Sprache ein vortreffliches Mittel der Propaganda. Die Beeinflussung fordert von jeher solche Spracharten, die in der einfachen Erzählung einprägsame und bewegte Handlung gestalten. … Aus dem weiten Gebiet der Sprache aber, die unmittelbar durch technische und wirtschaftliche Vorgänge an den Empfänger herangetragen wird, ist die wirksamste Art das Laufbild. Es verlangt eine ständige Aufmerksamkeit; es ist voller Überraschungen im Wechsel von Handlung, Zeit und Raum; es ist unausdenkbar reich im Rhythmus der Gefühlssteigerung und der Gefühlsverdrängung." ↑ Klaus Kreimeier: Die Ufa-Story. Geschichte eines Filmkonzerns. S. Fischer Verlag, 2002. ISBN 3596155754, p.309,310, Original, Goebbels: "Scham- und Geschmacklosigkeiten". ↑ Same source, p. 224. Original in German: "nicht das bloße Erdichten, sondern das zweckmäßige Erdichten einen schöpferischen Geist beweise." ↑ Emil Jannings: "Über den Film". In: „Nationalsozialistische Monatshefte“, Vo. 147, June 1942, p. 342,343. ↑ Fritz Hippler: Betrachtungen zum Filmschaffen, 1942, p. 23,24,29. Original in German, Hippler: "über Wesen und Unwesen des Startums ist genug gesagt und geschrieben worden, aber Startum hin Startum her: es ist nicht zu leugnen, daß die Menschen der ganzen Welt ein Hauptmotiv ihres Filmbesuches in dem Wunsch sehen, ihnen bekannten und beliebten Gesichtern wiederzubegegnen"; "europäisches Format"; "deutschen Schönheitsideal". ↑ Klee, Kulturlexikon, S. 227. (German) Albrecht, Gerd (1969). Nationalsozialistische Filmpolitik. Munich: Hanser.